Since the ending of Vatican II, the church has officially published no fewer than eight major documents calling for adults to be the center of the church's educational mission. And the Catholic faithful are calling on the church to quench their thirst for a deepening of their lived faith. They realize that the catechesis they received as children simply isn't enough to continue in the faith as adults in the church and world; they desire a deepened faith. In Deepening Faith, Janet Schaeffler, OP, offers a practical guide and source of encouragement to parish and diocesan committees, catechists, and adult faith formation teams. She outlines the essential foundations, methods and strategies that can support this journey for today's adults of all ages and generations. Janet Schaeffler, OP, is a facilitator of days of reflection, retreats, parish missions, and workshops. She is an author, university teacher, and facilitator of online classes for the University of Dayton and Boston College, and continues the ministry she was involved in for many years in parishes as director for Adult Faith Formation for the Archdiocese of Detroit. Janet makes the ongoing journey of adult faith formation come alive for those just beginning and those already in the field forming disciples. What I found most helpful were the Reflection/Conversation Starters as they invited me into the book, as well as to realize I could do this in my community a step at a time. She also renewed my hope for the USCCB's Our Hearts Are Burning Within Us to be implemented in our dioceses and parishes. This is an invaluable resource for those involved in forming adults in the faith. It ought to occupy the shelves of each member of the parish staff and pastoral council and its contents ought to be discussed at every meeting of parish leadership groups. Deepening Faith is a wonderful resource for developing or growing a parish's adult faith formation program. 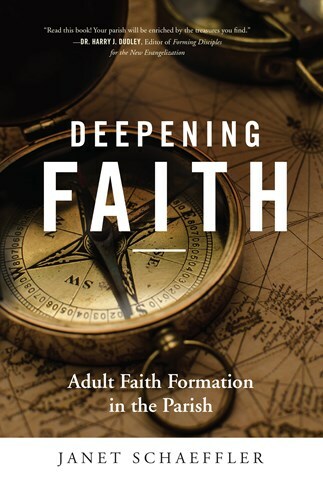 If you and your parish want a trusted guide to developing adult faith formation, then Janet Schaeffler and her new book Deepening Faith is exactly what you are looking for. Janet's wisdom and decades of experience shine forth on each page. You will be inspired by her vision, encouraged by her insights and examples, and equipped by her tools to make adult faith formation come alive in your parish. Use Deepening Faith with your team to create vibrant and vital faith formation for every adult in your community. Deepening Faith will inspire parish groups to enhance spiritual growth by expanding faith-filled opportunities and energizing disciples for a troubled world. Sr. Janet challenges us to be more proactive about building a healthy culture of life-long learning. Seasoned by experience and dialogue with adult educators around the country and the world, she guides us through the research, resources, and best practices that grow more healthy learning communities. Whether you are new to the task or have been doing this for some time, read this book! Read it together as a staff and your parish will be enriched by the treasures you find. Deepening Faith is a comprehensive, practical and user friendly handbook for transforming a parish into a learning community. It includes everything from adult faith formation theory to innovative options. The parish tested and well researched advice and the challenging reflection questions are invaluable for parish adult faith formation leaders. Effective parish adult faith formation planning requires this handbook along with Our Hearts Were Burning Within Us.